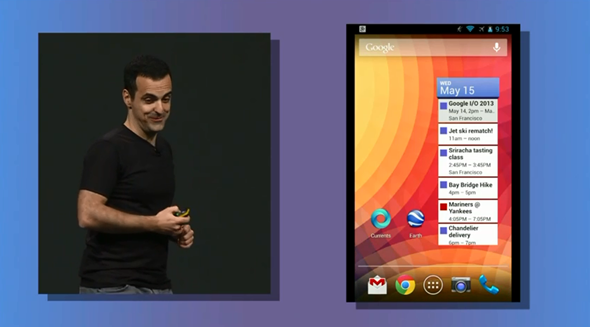 It had been rumored over the last couple of days, but Google’s Hugo Barra just pulled a Galaxy S4 out of his pocket during the opening Google I/O keynote. It’s not like any Galaxy S4 you’ve used before though, and it’s not like any you’ve likely seen before, either. In fact, it’s something hugely awesome, assuming you’ve got a spare $649. 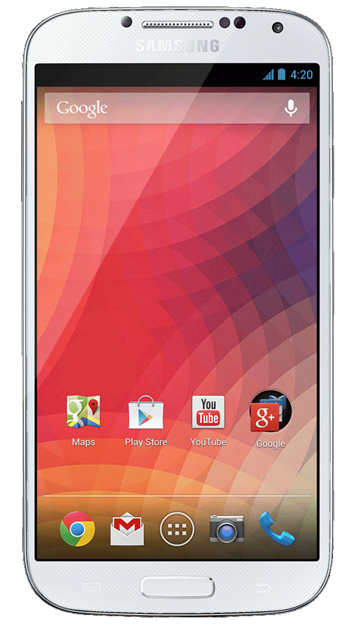 As it had been suggested yesterday, Google just announced that it will begin shipping a very special Samsung Galaxy S4. It’s special because, unlike all other Galaxy S4 handsets that we’ve come across (or seen) thus far, this one is sans Samsung’s bloatware. There’s no TouchWiz, and no carrier software. 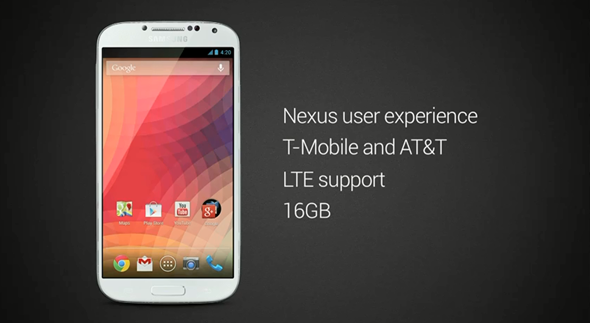 That’s right, Google just turned the Galaxy S4 into a Nexus phone. Which means that it runs stock Android 4.2 Jelly Bean without anything else on the top. Shipping on June 26th, this special Galaxy S4 handset comes with pure Google Android and as a result will receive all the latest and greatest operating system updates as soon as they are released – no more waiting for Samsung to have its wicked way with it, or for carriers to OK it before it gets pushed to your device. It’s the biggest reason to go Nexus, and now you can have the luxury of quick software updates whilst also having one of the best Android devices on the planet – Samsung’s Galaxy S4. Hardware wise, it’s exactly what you’d expect – it’s an S4. There’s LTE in there, and it’ll work on both AT&T and T-Mobile. Customers can buy the new handset straight from Google via the Play Store later this month, though we’ve not had confirmation on color options just yet. There’s one downside to the whole thing though, and that’s the price tag that it carries. If you’re the kind of person that likes their phone subsidized, then you’re going to balk at the $649 asking price for one of these. It’s certainly not cheap – it’s unlocked and unsubsidized of course – but it is arguably the Droid you’ve been looking for. Also, it comes with an unlocked bootloader right out of the box, so that’s big news for those who are into playing around with different settings and ROMs. You’ll just need to sell a kidney to buy one. Google I/O is shaping up to be a real win, not just for developers, and we’re watching for all the big announcements right now. We’ll bring them to you as soon as we have them! You can order the new Galaxy S4 with stock Android directly from the Play Store starting June 26th.